U.S. Patent No. 9,454,849 (the ‘849 Patent) describes a method for generating a virtual gaming environment based on real-world objects. The patent describes a scenario where a player puts on an augmented reality head set and begins to travel around the real world. During the player’s travels, he may encounter monsters or puzzles which is generated by the headset. The headset will generate the monsters based on the real world environment surrounding the player. For example, a player in a forest is more likely to encounter a forest monster than an ocean monster. While wearing the headset, players will be able to interact with both real objects and virtual objects. Virtual objects will be created based on a variety of factors, including the real world environment. 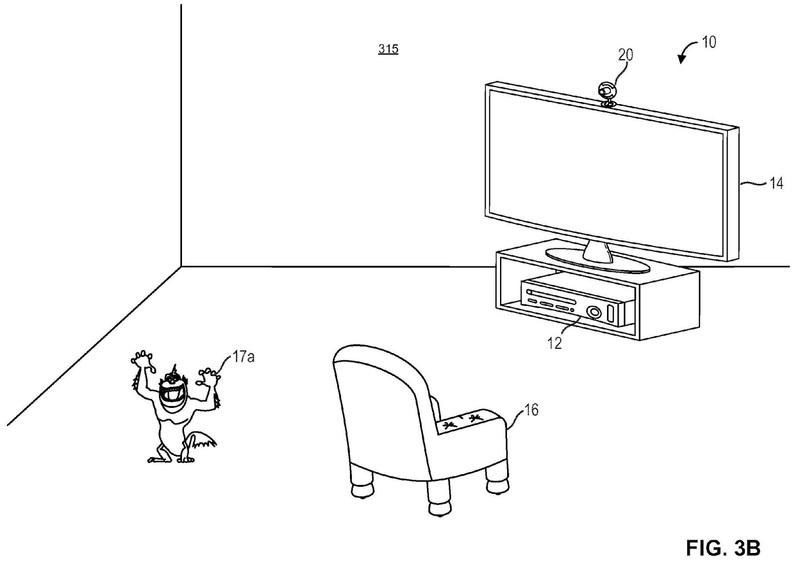 A system for generating a virtual gaming environment based on features identified within a real-world environment, and adapting the virtual gaming environment over time as the features identified within the real-world environment change is described. Utilizing the technology described, a person wearing a head-mounted display device (HMD) may walk around a real-world environment and play a virtual game that is adapted to that real-world environment. For example, the HMD may identify environmental features within a real-world environment such as five grassy areas and two cars, and then spawn virtual monsters based on the location and type of the environmental features identified. The location and type of the environmental features identified may vary depending on the particular real-world environment in which the HMD exists and therefore each virtual game may look different depending on the particular real-world environment. 1. A method for generating an augmented reality environment, comprising: generating one or more virtual objects associated with a computing application using a mobile device, the one or more virtual objects include a first virtual object: identifying one or more real-world objects within a first real-world environment that are of a particular type; acquiring a computing application requirement that a particular number of real-world objects of the particular type be identified within the first real-world environment from the computing application; determining that a number of the one or more real-world objects identified within the first real-world environment of the particular type is not equal to the particular number of real-world objects required by the computing application; adjusting the one or more virtual objects in response to determining that the number of the one or more real-world objects identified within the first real-world environment of the particular type is not equal to the particular number of real-world objects required by the computing application, the one or more virtual objects include a first virtual object that moves within the augmented reality environment; detecting a particular sound using the mobile device; determining a distance between the first virtual object within the augmented reality environment and the mobile device; setting a degree of transparency for the first virtual object based on the distance between the first virtual object within the augmented reality environment and the mobile device in response to detecting the particular sound; generating one or more images associated with the first virtual object based on the degree of transparency; and displaying on the mobile device the one or more images, the one or more images are displayed such that the first virtual object is perceived to exist within the augmented reality environment.